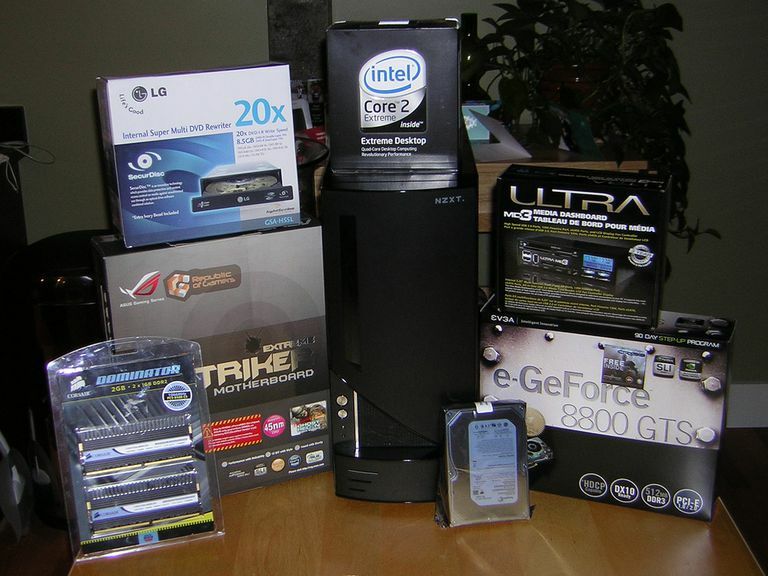 Tutorial and step by step instructions of building a gaming PC. To some the thought of building your own PC is a daunting even unthinkable undertaking; very few people venture inside a computer case let alone attempt to put one together from scratch. Well the good news is that everyone can relax because it's really not as difficult of a task as you may think and I'm going to show you how. This past November, right around Thanksgiving, I had just finished graduate school and finally had enough time to get caught up reviewing the stack of games that had been piling up on my desk for the upcoming holiday rush of new releases when my PC crashed. As best as I can diagnose I believe it was the motherboard that died. I guess it could have just as easily been the CPU but I tend to think that CPUs have a little longer life than a Mobo. Especially a Mobo on bare bones budget PC as I had. In the past when it came to buying a new PC my moto was to buy cheap and upgrade. I bought a budget eMachines desktop back in the fall of 2005 for under $500. Out of the box, this was not what I would have called a gaming PC, in fact, many games wouldn't run on it, but I immediately upgrade both the graphics card and RAM and voila my gaming PC had come to life. This time around I wasn't going to go cheap and have it die on me in less than 2 years, I also had some pretty specific system specs I wanted to meet. After a week of looking at most of the gaming PCs built by the big guys (i.e. Dell, Alienware, HP, Sony etc...) I came to the realization that those PCs weren't going to meet my specific specifications for the price I was willing to pay. Another big I've had more recently with pre-built PCs, either store bought or mail order was the dozens of unnecessary programs or junkware that comes pre-loaded. A 90-day McAfee trial, 60-day Norton trial, MS Office trial and so on. There must have been 15 or more junkware programs that I had to spend hours trying to delete. These programs are not only annoying with all of their pop-ups but they tend to slow your startup and operating system down considerably. It was at this time that I decided to take a stab at building my own PC. My article on building your own gaming PC goes through the individual parts that I used in my gaming PC, as well as providing links to other great parts that I had to choose between. Please excuse my amateur photographs but I've also uploaded my photo log of the parts and process to help visualize it better. I chose the NZXT Hush over other cases partly because of it's price and of the very good reviews it received on airflow and ease of installation. Front panel cables are long enough to reach anywhere in the case and the case is lined with some sound dampening foam which works very nice on cutting down on fan noise. The case also comes with 7 expansion slots in the back and 6 front drive bays, four 5.25 inch bays and two 3.5 inch bays. The configuration of my PC at the time of writing probably only needs a 600 Watt power supply at most. However, I wanted the option to upgrade, adding a second PCI-e SLI graphics card or a multi hard drive RAID configuration is going to take extra power. I had originally decided upon the Ultra X3 800 Watt power supply but found the Ultra X3 1000 Watt online for only a few dollars more which made my decision to go with the larger much easier. The Ultra X3 1000 Watt power supply is both energy efficient and quite. It also allows you to plug in only the cables you need so there won't be any extra dangling inside the case. There are also 6 and 8 pin PCI-e power connectors for the latest graphics cards. Deciding on which CPU to choose from was probably my toughest decision. When I began this process I knew I wanted a multi-core CPU, I chose Intel over AMD because the Intel currently has the market cornered on multi-core CPUs with the majority of their CPUs benchmarked faster than anything AMD had put out in the past year. The site Tom's Hardware and their CPU charts and comparison was very helpful. I decided upon the Intel Core 2 Extreme QX6850 Quad-Core Processor which is now Intel's 3rd faster CPU available, behind the QX9770 and the QX9650. Right now the performance isn't a lot better than the high end dual core CPUs but I'm banking on the benifits of having a quad core CPU when games optimized for quad-core start being released. CPUs packaged by the manufacturer typically include a Heatsink and fan, this was the case with my QX6850. You can save a few extra dollars by purchasing your chip OEM, but this will only include the chip, no manufacturer packaging, manual or heatsink/fan. Typically the heatsink/fan that comes from Intel or AMD is not sufficient if you want to perform any overclocking. Although I don't plan on doing any until my chip starts to show the signs of being dated, I bought a Zalman CNPS 9700 LED based on numerious good reviews. As you can see from the picture it is quite large but fits in my mid-tower NZXT case with ease. The fan is extremely quiet at idle, does get a little lounder than I expected when it's RPM is cranked up. When choosing a motherboard I wanted one that would support Intel's new 45nm Chip architecture, I also wanted one that would take advantage of the 1333MHz front side bus(FSB) found in the QX6850. The Striker Extreme supports dual channel DDR2 RAM, NVIDIA nForce® 680i SLI as well as all the cables and power cords you'll need. I also wanted a mobo that would support the USB, firewire and other media slots in the front panel media reader I wanted to install. The Graphics Card is probably the second most important component for gaming behind the CPU. When I first set out I had planned on going with the 8800 Ultra but at a whopping $700-800 price tag I decided to reconsider. I finally decided on the brand new eVGA GeForce 8800GTS 512MB. This graphics card is built on a new architecture and despite having less memory that the GTX and older 8800GTS (which are both a year old), it runs on less power and has out performs both. The price to performance ratio of this card was head and shoulders above the others and made my decision easier. One fact that many people don't realize is that having more RAM isn't always going to make your applications run faster. 32 bit operating systems only support the use of 2GB of RAM so putting 4GB into your PC isn't going to make things run faster since the OS can't use it all. 64 bit OSs can support up to 16GB of RAM but the move to 64 bit operating systems has been a slow one. We'll get there eventually but until that time I decided to stick with 2GB and select Corsair Dominator RAM which is well know for PC gaming RAM. I went with the Seagate Barracude 500GB hard drive based on past experience. I've had Seagate hard drives in the past and have never had any problems with them. That's not to say other brands are any different, I just went with what I knew and was comfortable with. It'd be nice to have a second hard drive so I could set up some sort of RAID control but that will have to wait for now. There are dozens of different DVD Drives, I decided upon the LG GSA H55L basically because it was onsale at Best Buy and had all the features I was looking for. Read/Write in any format DVD+/-R, DL+/-R DVD RW, etc... and had Lightscribe labeling capablility. One think I liked about my old eMachines PC was it's front panel media reader. For my new PC I purchased the Ultra MD3 Media Dashboard. This media reader allows be to insert most types of media cards; USB, Firewire, SD, SDHC, SM and others. In addition to the media reader it also comes with 2 fan controls and temperature readouts with alarms. Some basic tools is probably all you'll need for building your PC. A phillps head screwdrive, needle nose pliers, static gloves, plastic fasteners, and electricians tape is all I used. The static gloves or grounding strap is very important and you don't want to pass any static charge on to any of the components before you even get it running. I'd also recommend a pair of scissors for cutting the plastic ties and a small magnet for pulling out those small screws you may drop but that's about all. Steps 6-9 can be performed before or after steps 1-5 the key is that you want your case set and ready along with the CPU and RAM installed in the motherboard, prior to installing the motherboard in the case. Before starting to put everything together it's important you at least review the manuals and know generally where your components will go. For example most Motherboards come with pretty good labeling on the board itself but it's still a good idea to what all the pins and sockets do before you start. Setting up the case prior to installing anything is quite simple. Every case is different some complete completely setup, while others require you install the case fans. In the list you can expect to un-twist some twist ties and move the cables so they don't obstruct anything you're going to be installing. The most important task in this step is to install the motherboard standards. These are small screws or spacers that the motherboard will be mounted on. Most cases support multiple motherboard layouts so you'll want to make sure you place the standards in the correct case slots so you can later line up the screw holes in the motherboard. If a power supply comes pre-installed with your case then you can skip this step. The majority of cases available however do not come with a power supply due to the fact that power requirements vary quite a bit depending on the components you'll be installing. Installation of the power supply, like preparing the case is quite simple. Just make sure you have the power supply fan and rear power cord jack is facing the correct direction and that the screws are securly fastened. I chose to install my DVD and media reader next. I've seen other tutorials recommend doing this step after the motherboard has been installed but by installing these now, prior to the motherboard will in many cases avoid having to maneuvar cables around your RAM and/or CPU fan. Snap out the front panel, pushing or pressing on the plastic tabs from the inside should release them, and then slide the DVD or other drive into the bay from the front feeding any cables in first. I installed the media reader on top mainly because there was a more direct route to the CPU for the fan and temperature controllers than there was on the second drive bay down. The DVD went into the second drive bay without a hitch. Installing the hard drive was another step that I chose to do prior to installing the motherboard. The way the internal HDD bays line up with other components I found it easier putting this in now rather than fight with cords and components trying to slide it into the drive bay. The screwless drive bays in the NZXT Hush case made installation a breeze. If there is a most important component to your PC, the CPU is it. This delicate microchip is the brain of your PC and should be handled that way. You never want to touch the CPU pins, holding it by the edges is the best recommendation. Installing into the motherboard is not overly difficult. The CPU socket on the motherboard is generally easy to find and is covered by a load plate and load plate cover to protect the socket when the CPU is not installed. The first step of installing the CPU is to gently unfasten and life the load plate. The load plate/socket cover should push out without having to apply too much force. Once the load plate is up you'll want to align the CPU with the socket. Intel CPUs have two tiny groves cut out on opposite sides of the silicon which should line up with two notches in the socket. Line them up and gently drop in the CPU. Intel's multi-core CPUs (Socket T/LGA775) are a "pinless" design, meaning they don't have actual pins sticking out that fit into the holes of a socket. Instead they use tiny contact points which align with the socket's contact points. This means there's no need to push the chip or a risk bending any CPU pins. Some older chips, both AMD and Intel, still use the old technology but if you're building a new PC you're most likely using a new chip. Once the chip is resting in place, close the load plate and secure it with the load lever. At first this may seem like you're pushing down a bit hard but as long as you're using the level and not putting much (if any) force on the load plate everything should be fine and your CPU will be locked in place. Just prior to installing the CPU Heatsink and fan you'll need to apply some thermal compound or grease. Thermal compound helps transfer the heat generated by the CPU to the heatsink better. All you need is a thin coat, the Zalman CNPS9700 LED heatsink I used came with a small bottle and brush to apply but it your compound is in a tube just apply a small amount and spread it evenly on the chip with something flat (i.e. an old credit card, business card, etc...). If you're using the factory Intel or AMD heatsink you'll need to purchase some thermal compound seperately. After the thermal compound has been applied you're ready to install attach the heatsink. With Intel and AMD heatsink/fans the fan blows directly onto the CPU from the top so you don't need to take any of the other fans inside the case into consideration. However if you have a heatsink/cpu fan that's geared more towards overclocking like the Zalman CNPS9700 LED that you'll need to make sure the orientation of the fan blades is correct and matches that of the case fans so air is being blown in the same direction. In the case of the NZXT Hush case, there is a intake fan in the front and an exhaust fan in the back so I want to make sure my CPU fan is blowing air towards the back of the case. Each case and CPU heatsink/fan can be different so it's best to read the manual for correct installation. Actually installing the CPU heatsink is just a matter of locing down the fasteners or screwing in the mounting screws. Once this is done, go ahead and plug the fan cable into the motherboard CPU Fan connector. The last component to install onto the motherboard before installing it into the case is the RAM. Start by locating the empty RAM slots on the motherboard. The vast majority of motherboards will have DDR2 RAM slots, there should be at least two slots, with mid to high ending motherboards having four. Located on either end of the RAM slot are retaining clips that will hold the RAM in place, open these by pushing them in opposite directions away from the center of the slot. Then with both hands pick up the RAM memory module bit it's edges and line it up with the socket so the groved portion of memory lines up with the notch in the socket. It only fits one way so you'll want to make sure you have this correct before pushing it down into the slot. When you're confident you have the RAM chip lined up properly push down on both ends until the retaining clips snap into place. Repeat this process for as many RAM memory modules that you're installing. By this time all the hard work starts to pay off as you'll begin to see the internal parts of the PC start to come together. Prior to installing the motherboard, as mentioned in step #2, make sure you have cleared the motherboard area in the case of any cables and make sure the standings are in the proper position for your specific mobo. Then gently lower the motherboard onto the standings and insert the screws. Screws should secure the motherboard to the case, but they should not be too tight, as you don't want to damage the board. You also don't want it loose enough to where it can be moved around at all. Next on our list of things to do is install the graphics card. There are two types of graphics cards; AGP cards and PCI-e Cards. AGP Cards have become less favorable in gaming PCs as they typically don't run as fast or have as much on board memory as PCI-e cards. PCI-e graphics card also have the ability to be paired with a duplicate card this nearly doubling your graphics computing power. The dual graphics cards do need to be of the same brand and model however. Much like insterting the CPU and RAM modules, graphics cards are going to snap into the PCI-e or AGP slots in much the same fashion. You will first need to remove the back plate from the back of the case and then carefully insert the card into the empty expansion slot, fasten it to the case and you're all done. Loading the drivers from the CD-ROM will happen after you've installed the operating system in step 15. Installing other cards is very similar to what was done for the graphics card; remove the back expansion plate and insert the card into the proper slot. For my set-up I needed to install the sound card that came along with the ASUS Striker Motherboard. A great addition for the future will be another graphics card and possibly a Phys-X card. The biggest challenge I found was trying to make sense of how to organize all of the cables. Connecting the CD-ROM, Heatsink/CPU fan, Hard Drives and everything else is quite simple. The motherboard was labeled very nice and connecting them was straightforward. One tip when hooking everything up is to try to keep the calbes from getting tangled up too much. This is where the plastic ties came in handy, I also used some electral tape to tape some cables down so there were out of the way in case I need to get back in to add or change something. Connecting the keyboard and mouse is the next logical step prior to powering up the PC for the first time. I would recommend not closing up the case just yet as you may need to make some minor tweaks or change some connections to make sure your BIOS is working right. We're not ready to fire up your PC for the first time. Setting up the BIOS shouldn't be hard and in most cases if you've connected everything correctly you most likely won't need to do anything. Simply Turn the PC on and wait for the BIOS startup messages to appear. I'd recommend inserting your Operating System Disk at this time since you'll probably get a OS not found error. I did have a minor issue with my BIOS setup; since I'm using an external Fan controller the CPU fan was not connected to the motherboard and this it was throwing an error stating that the CPU fan speed was too low (it displayde 0 RPM) I reconnected the CPU fan to the motherboard and it started up without issues the second time. Before closing up the case, it's good to make sure there are no loose cables floating around that could interfere with fans or anything else. Plastic ties and some electral tape or fasteners should do the trick here. Once everything is closed up, connecting speakers, printers and any other externam perperihals can be done at this point. It's good to have everything connected so you can get all the drivers loaded as you're installing the operating system in the next step. At this point you're at the home stretch, installing the Operating System is very easy just insert the CD-ROM and follow the onscreen installation and setup wizard as you are prompted. Microsoft tries to include a comprehensive list of drivers with Windows but it's not always the case. In this step go ahead and install any missing drivers so everything is functioning and recognized correctly by the OS. Now's the time to throw in that first game you've been dying to play, install and enjoy! Ever Thought About Building Your Own Laptop? You Can.